THE STORY - Laura and her two children travel from Argentina to Spain to attend her sister's wedding. The joyful reunion soon turns tragic when her older daughter gets kidnapped -- revealing a dark web of hidden secrets. THE GOOD - The film once again shows Farhadi's skill at directing actors, as well as his ability to slowly reveal his major dramatic themes within completely naturalistic dialogue. THE BAD - After making narrative breakthroughs in "A Separation" and "The Salesman," Farhadi seems confined by the demands of a genre film, and the results feel at times like he's spinning his wheels. "Everybody Knows" is a storyline of Oscar-winning Asghar Farhadi's 2009 film, "About Elly" which focused on the disappearance of a young woman at a celebratory family gathering. He obviously likes this plot as it bears many similarities to "Everybody Knows." One of the few directors to win Academy Awards for two foreign-language films, Farhadi made enormous narrative strides in his screenplays for those works, "A Separation" (2011) and "The Salesman" (2016). One of Farhadi's major skills as a writer is to disguise his films' major themes within naturalistic dialogue, so in what sounds like a casual conversation can reveal what Farhadi is really trying to say. It's a skill that is uniquely his among screenwriters working today. 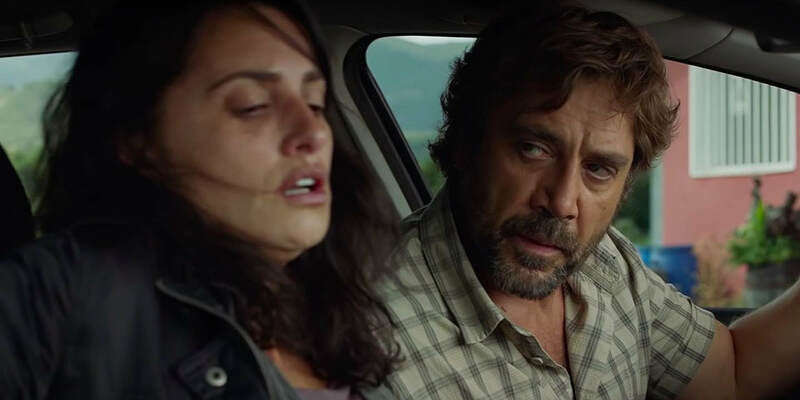 That ability is amply evident in "Everybody Knows" as we follow the story of Laura (Penélope Cruz) who has returned to Spain for the wedding of her younger sister, Ana (Inma Cuesta) at the family mansion just outside of Madrid. Traveling with her daughter Irene (Carla Campra), and son Diego (Ivan Chavero), Laura is joyously reunited with her father Antonio (Ramon Barea), and the mood at once becomes festive. Once Irene is wed to her groom (Roger Casamajor), the party starts. Anyone who's seen a movie or play that involves a wedding reception knows that the real drama comes out when the guests have had a little too much to drink and secrets are inevitably revealed. So it is here when local winery owner Paco (Javier Bardem) reunites with Laura with whom he was once romantically involved, and sparks still fly. (On a side note, I don't ever think I've seen Bardem, who specializes in brooding or threatening characters, play someone so genuinely happy as Paco -- when Bardem revealed a joyous toothy smile, it was as much a revelation to me as Garbo speaking). Meanwhile, Irene is having a tryst of her own in the bell-tower with Paco's nephew Felipe (Sergio Castellanos). It seems that both apples don't fall far from both trees. Suddenly the power goes out and a thunderstorm begins to rain on the partygoers, a sure sign that the tone of the movie is going to change. And change it does when it is discovered that one of the family members has vanished from the party. Is it a voluntary disappearance, or is it something worse? When the first ransom note comes in, it's clear to the family that it's something much worse. It's the transition from a light romantic comedy to a kidnapping saga where "Everybody Knows" encounters some bumps in tone along the way. Laura's much-older husband Alejandro (Ricardo Darín, very good), who had been detained on business in Buenos Aires, appears on the scene as does a retired detective (Jose Angel Egido) who asks some very personal questions in his investigation of the abduction. What's missing in the shift to the kidnapping story, however, is Farhadi's voice. Even though the tone in the first hour of "Everybody Knows" is lighter than in "A Separation," "The Salesman" or his underrated 2014 film "The Past," they all speak from the same sensibility with a writing style that at first seems merely conversational it but only later reveals hidden depths of meaning. Unfortunately, most of that is gone in the mystery saga in which the dialogue takes a "just the facts, ma'am" approach and the focus remains more on "who done it" and less on "why they did it." Yes, there are revelations still to be had, but unfortunately the big plot twist of "Everybody Knows" is easily guessable by the film's casting. Still, there's enormous pleasure provided with the presence of Cruz and Bardem together. Their on-screen chemistry leaves no doubt that Laura and Paco were (and still are) right for each other, and when they're together, there is at times a hint of melancholy when they look back at what they might have had if they had stayed together. Farhadi's skill with actors still shines through -- there must be a couple of dozens supporting roles here, and the performers involved each adds a little to the mosaic of the story. And the film is a pleasure to look at -- the cinematography by 80-year-old José Luis Alcaine is pitch perfect -- with lush golden tones during the celebratory scenes to the blues and greys of the scenes in the investigatory sequences, matching the varying moods of the characters to the visuals. Still, "Everybody Knows" must be chalked up as a bit of a disappointment for Farhadi fans. After the twin triumphs of "A Separation" and "The Salesman" (plus I'd add "The Past" too), "Everybody Knows" feels like a backward step for Farhadi by reviving a plot that may have worked for him in 2009, but one that sadly downplays the many gifts that he has developed since then.